Welcome to the November issue of Weight Watchers magazine. This month, we’re making fitness fun and celebrating the best of autumn, from cosy fashions to comforting meals. So, whether you’re looking for motivation, recipe ideas or expert advice, we’ve got it covered! Katie shares how getting healthy helped her rediscover her smile; Sharon and Claire tell the story of their incredible friendship; Ian reveals how he’s overcome enormous health hurdles thanks to an incredible 8st weight loss; and Jamie thanks his mum for encouraging him to turn his life around. Love baking? Star baker Selasi Gbormittah shares his pic of baked delights from our new Comfort cookbook and whips up a tempting sticky pudding. 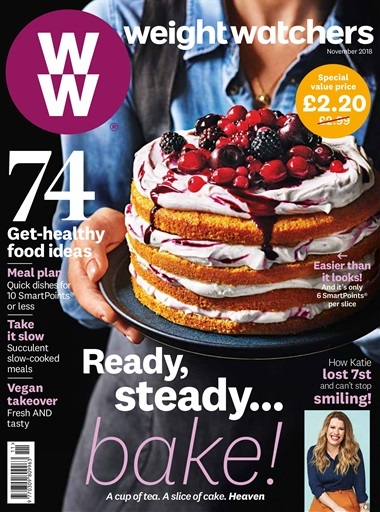 You’ll also discover slow-cooked meals worth waiting for, quick seasonal dinners, and delicious vegan-friendly food ideas in our WW Kitchen special. Cosy up with new-season knits to suit your shape and discover creative ways to get active – one even involves goats! There’s also a roundup of the latest on-trend Korean beauty buys, we lift the lid on diabetes, and our team of experts answer your questions on health, fitness, nutrition, wellbeing and style.